Garden Spot Auto Auction has been serving the greater Pennsylvania area for over 50 years as the premier independent auto auction. With a strong focus on service, we’re always looking for ways to serve our customers better. Join us each Tuesday at 10am for our Dealer-only auctions. 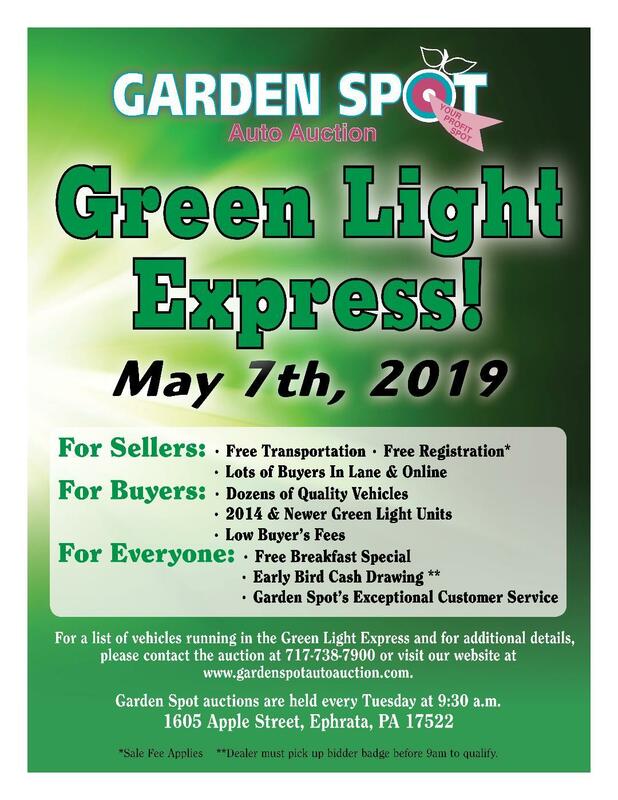 We're looking forward to seeing you at Garden Spot Auto Auction! is an Auction Access partner. 4/2 - Regular Consignment Auction - 83% SOLD!!! 4/9 - Regular Consignment Auction - 82% SOLD!!! 4/16 - Regular Consignment Auction - 87%* SOLD!!! * - Yes, that's REALLY 87% SOLD!!! Green Light Express returns May 7th - Get on Board! In business since 1964, Garden Spot Auto Auction is dedicated to serving new and used car dealers. Since its founding, the auction has maintained the same sale day, the same involved and caring ownership, and a courteous staff who's focused on providing dealers with the best possible auction experience. We value the relationships we've built with our customers and we look forward to seeing our business partners each Tuesday. Our staff is always available to help make each of our guests have a smooth and properous day. Garden Spot is the Dealer's Profit Spot!